Trulite Glass and Aluminum Solutions produces Pyrodge™20 tempered glass and inventories fire-protective tempered wired and clear glass ceramic products from Technical Glass Products. To reduce lead time and cost, fire protective products are produced to order and shipped on our fleet of trucks directly to your facility or job site. Trulite Glass and Aluminum Solutions fabricates and ships Fireframes® Designer Series by Technical Glass Products. Fireframes Designer Series meets positive pressure standard UL 10C. Full vision entrance doors are available with a wide variety of hardware to meet project requirements. Doors and frames are fully assembled, welded, and powder-coated to match the desired color scheme. Doors and sidelites may be glazed with Pyroedge™20, WireLite®, FireLite®, FireLite NT, or FireLite Plus®. Trulite Glass & Aluminum solutions inventories Fireframes® Aluminum Series by Technical Glass Products for quick fabrication and shipping. 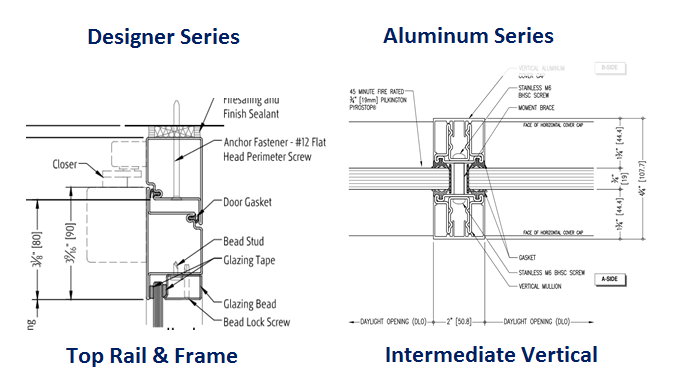 Fireframes Aluminum Series is the only system that closely resembles traditional 2″ X 4-1/2″ storefront framing and passes the UL 263 wall assembly test standard. The frames feature clear anodized aluminum covers and other anodized finishes are available. Fireframes Aluminum Series, when combined with Pilkington Pyrostop® glass, provides a barrier to radiant and conductive heat transfer. Trulite inventories and fabricates 45, 60, and 120 minute Pilkington Pyrostop glass to ship with the Fireframes Aluminum Series frames. Trulite Glass and Aluminum Solutions inventories, fabricates, and ships Pilkington Pyrostop® glass directly to your shop, or job site. Pilkington Pyrostop® is available in 45, 60, & 120 minute configurations to protect against radiant and conductive heat transfer, meets hose stream test requirements, and is impact safety-rated in accordance with ANSI Z97.1 and CPSC 16CFR1201 (Cat I and Cat II). Pilkington Pyrostop glass is available in an insulated unit and may be glazed into Fireframes® Aluminum Series also produced by Trulite.